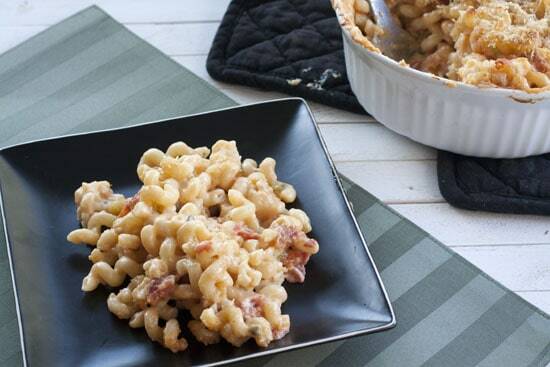 Rich and creamy homemade cheese sauce mixed with pasta and tomatoes and then baked to perfection! Delicious! 1 cup Sour cream (or Greek Yogurt. The original calls for Creme fraiche which is nice if you can get it). 1) Boil your cut up cauliflower in a large pot of salted water for 3 minutes, until tender but still crisp. Pull out your cauliflower, but keep the water to make the pasta in! 2) Melt 2 TBSP. butter in large sauté pan over medium-high heat. Sauté cauliflower for five minutes. Add tomatoes and onions. Cook for a few minutes just to combine all the yummy flavors. 3) In a separate pan, make your Roux by melting 2 TBSP. butter and whisking in 2 TBSP. flour. Cook for a few minutes and then slowly add in your cream and milk. The mixture will thicken pretty quickly. 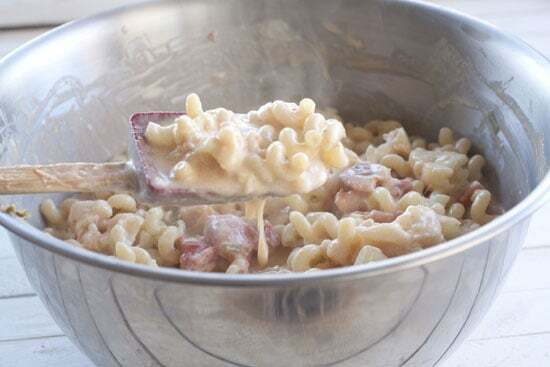 4) Add your cheese slowly until it is all melted, then sour cream or creme fraiche, 1/2 of your Parm, and mustard. Season with Salt and pepper and remove from heat once it is thick and cheesy and awesome. 5) Cook your pasta in the cauliflower water. Drain the water. 6) Add your cauliflower mixture to the pasta and pour sauce over it. Combine well. 7) Pour into a buttered 13X9 baking dish. 8 ) Top with breadcrumbs and the rest of your Parm. 9) Bake at 350 for 40 minutes until golden brown. The recipe I used for this Cauliflower Macaroni and Cheese dish was from a Bon Appétit which means that it has a lot of ingredients. Sometimes BA tries to slam as many ingredients into a dish as possible. Meanwhile, there I am at the store pulling my hair out. Things like: This recipe originally called for “heirloom tomatoes.” While I love those things, they are expensive and you put so much cheese and other stuff in this dish, why would you need those? 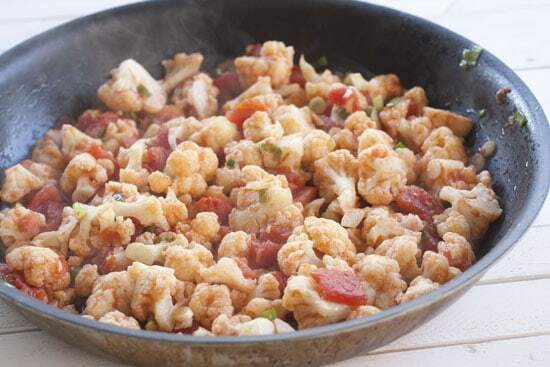 I just mixed in a can of diced tomatoes with my sauteed cauliflower and onions. 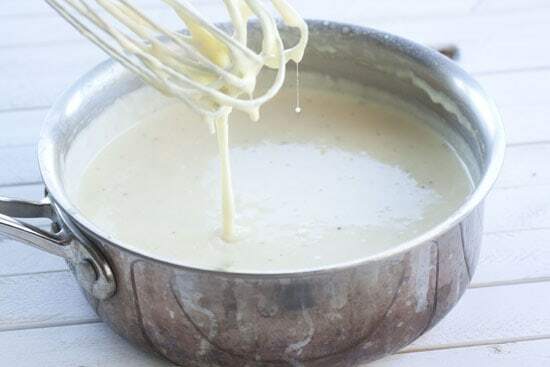 To make the cheese sauce, melt the butter in a medium pot and then whisk in the flour. Cook it for a few minutes over medium heat until it’s lightly browned. Then slowly whisk in the cream and milk until it is thickened nicely. Then stir in all your cheese along with the sour cream (or creme fraiche) and season it with a bit of mustard, and some salt and pepper. Mix this sauce with your macaroni and cauliflower mixture and you’re all set. Scoop this mixture into a buttered baking dish and top it with some breadcrumbs and extra Parmesan cheese. Then bake it at 350 degrees for about 40 minutes until it’s nicely browned on top. It will be incredibly hard, but let this cool before you jump in. This dish is not the easiest that I’ve made on this site, but if you take things one piece at a time, it is very doable. I need a larger plate. 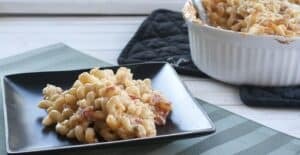 Betsy is constantly requesting this Cauliflower Macaroni and Cheese so I thought it would be the perfect way to kick off a week of her favorites! That looks amazing. I may have to make it soon. One thing: "- 3 cups good cheese (I used Gruyere, some swiss, maybe a bit of cheddar.) You wanted want to use all cheddar or cheeses that won’t melt well." This looks awesome. How obvious is the cauliflower in the final dish- does it get overpowered by the cheeses etc? (Trying to sneak it by some picky eaters.) Also, are the noodles cooked beforehand or no? Thanks! The cauliflower and noodles are cooked, the printable version is more definitive in the steps. But there’s always some good tips in the main article. Like Leah, I am wondering how obvious the cauliflower is?? My kids are REALLY picky. 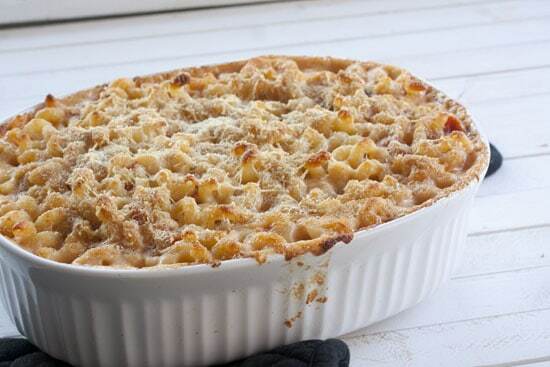 if you roast the cauliflower and give it a wiz in a food processor it will blend seamlessly into the mac and cheese! i was able to sneak past a child a babysit who is a mac and cheese purist and she never knew. And yes, you need to cook the noodles before you bake the dish. Good luck! I can totally see why this is one of Betsy’s favorites! I liked this, however, thought it was way too greasy. I cut the recipe in half as I was giving it a trial run, and I left out the sour cream and onions (personal preference). I used a mixture of shredded gruyere and swiss along with the parm which was delicious. I dont think it needed cheddar. Next time I will increase the amount of cauliflower and decrease the amount of pasta, cheese and butter a tad. Will use elbow pasta next time instead, this was very filling, great comfort food! Thanks for the comment and notes Sara! Thanks for reading! Great recipe! I really like the combination with the cauliflower. I made a big portion and have been eating it the whole week without getting tired of it. :) Regards from Berlin. Would this be freezable? With the sour cream in it? Anyone tried freezing it? Hmm… I’ve never tried to freeze this (never have leftovers)! I think it would freeze just okay… Lasagna does great in the freezer but isn’t so reliant on the sauce.